With the Marco family back in the SDAV family and with very good cars after a couple of season settling in and new building cars for the ‘boys’, this season could be something special for the family and Stan Marco Snr kicked it off very nicely indeed when he won the recent opening event of the season at Laang Speedway. With rollovers, spins and other breakages going on around him, Marco held his composure to take a hard thought victory ahead of Shannon Meakins and Marco’s own son Stanley Marco Jnr and judging by his social media pages, Marco could not be a prouder man. Getting straight to the action that occurred on December the 9th, starting from the front row in the first heat Jamie May beat Shannon Meakins off the line with Phil Jenkins back in third ahead of Stanley Marco Jnr. From the rear of the field the Victorian Champion Jason May moved ahead of Michael Coad, Stan Marco, Vaughan Matthey, Kali Hovey, Russell Hovey and Chris Wilkes before Coad passed him on the second lap and May went back passed him on the third in a great battle. At the front Jamie May continued to lead Meakins and Jenkins with Jason May passing Stanley Marco on lap four and Jenkins on lap six. After eight laps Jamie May took the win from Meakins, Jason May, Jenkins, Stanley Marco Jnr, Coad, Kali Hovey, Russell Hovey, Wilkes and Stan Marco with Matthey pulling out of the race on lap five with carburettor issues, Wilkes spun on this lap causing a caution also. Russell Hovey began heat two from the front row with Wilkes alongside him and Stan Marco and Kali Hovey on the second row. The first start was aborted and the field lined up to go again. Russ Hovey led from Stan Marco and Kali Hovey, with Jason May moving to third on lap two. On lap three Kali Hovey and Jamie May connected and both rolled in turn three and had to be re-scrutineered back in the pits after touch ups to repair the cars. At a re-start oil on the track at the scene of the accident caused Russ Hovey, Stan Marco and Stanley Marco Jnr to spin in turn three causing another stoppage. Wilkes busted his differential and he joined a growing stockpile of cars in the pits. When the race got flowing again, Russ Hovey held the lead and won from Stan Marco, Jenkins, Stanley Marco Jnr and Jason May. Meakins was a non-finisher for breaking his belts earlier at the scene of the accident which involved his wife Kali Hovey. Jason May and Coad began from the front row in heat three with Jamie May still in the pits fixing his car after the rollover, whilst Kali Hovey made it back on track to compete. Coad lead Jason May and Stan Marco with Marco passing Jason May on lap three. Coad out in the lead took a win over Stan Marco, Meakins, Stanley Marco Jnr, Jason May, Russ Hovey, Jenkins and Kali Hovey. A coin toss put the highest scoring drivers in the heat qualifiers off the front of the field. Marco led Russ Hovey, Meakins, Jason May, Jenkins, Marco Jnr, Coad, Jamie May and Kali Hovey with Matthey and Wilkes with their Carburettor and differential issues not able to start. Jamie May made it onto the track for the start of the race after fixing the car from the second heat rollover, however couldn’t get the car to fire and Kali Hovey despite finishing heat three, was having issues with her car related to the rollover and she parked in field after a few laps. 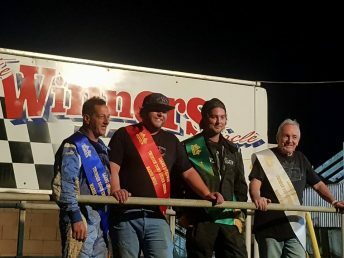 The tight little Laang Speedway track then enjoyed a fifteen lap final from the SDAV Hot Rods with Marco leading Meakins and Jason May on lap one. In the pack Jenkins, Coad, Marco Jnr and Russ Hovey battled on. On Lap ten whilst in third, Jason May spun in turn two and the yellows came on to send him to the rear of the field for a re-start. May tried to recover and moved to fifth on lap thirteen, however spun on lap fourteen in the same turn. Marco went on to take the big win from, Meakins, Marco Jnr, Jenkins, Russ Hovey, Coad and Jason May at the back of the field.